When folded, the seat has a projection from the wall of only 111mm plus you see the stylish top of the seat rather than the underside. To deploy it you simply pull out the front edge so that the rear of the seat slides down, the arms then fold neatly in to place. 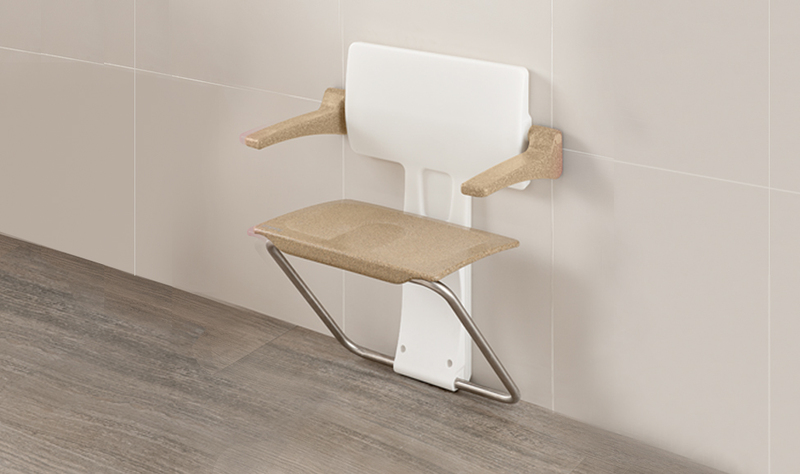 The non-obstructive cross bracing legs allow the seat to be mounted at any height from 417mm upwards, making it suitable for both children and adults. Most seats have a weight limit of around 190kg, however Slimfold has been designed to withstand up to 300kg and has undergone a number of stringent tests to guarantee structural safety and security. 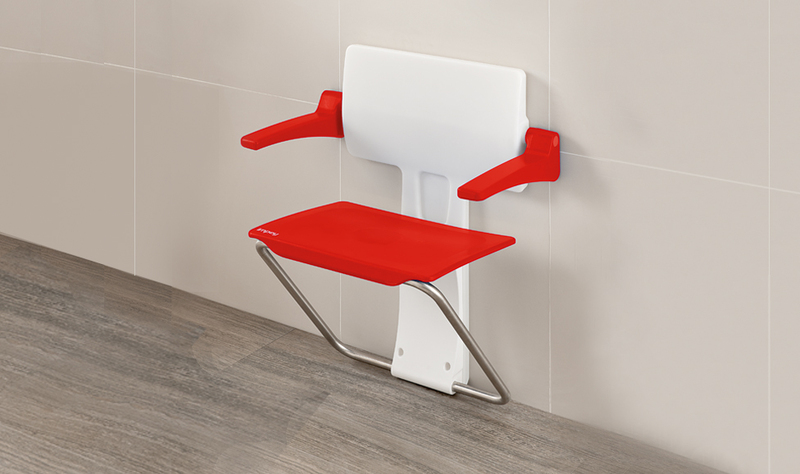 The seat comes in a variety of six colours, adding an element of choice to a product that is already a more attractive proposition than current market alternatives. 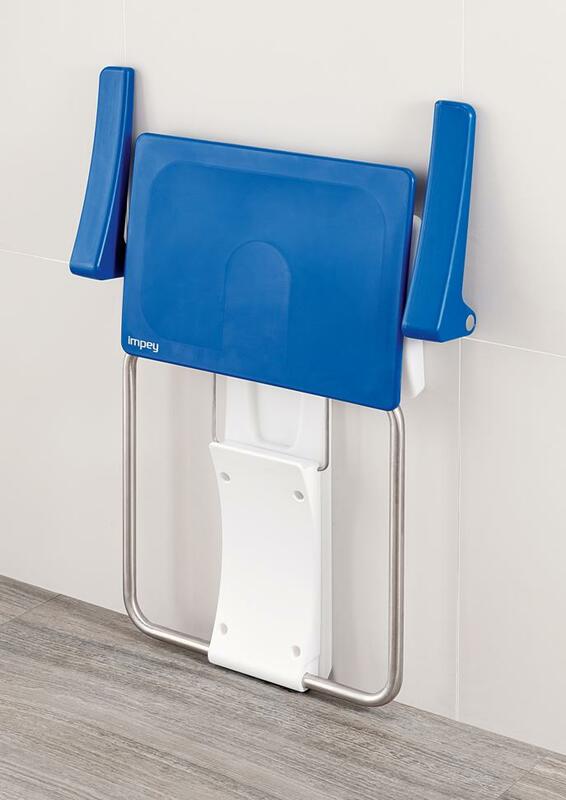 The matching seat and arms of Slimfold's design adds to the aesthetic appeal whilst maintaining good use of colour contrast for the visually impaired. 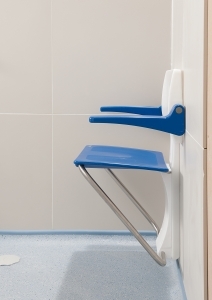 The Slimfold seat has been widely endorsed by care professionals across the industry, suitable for use within an individual's home right through to care housing and hospitals. 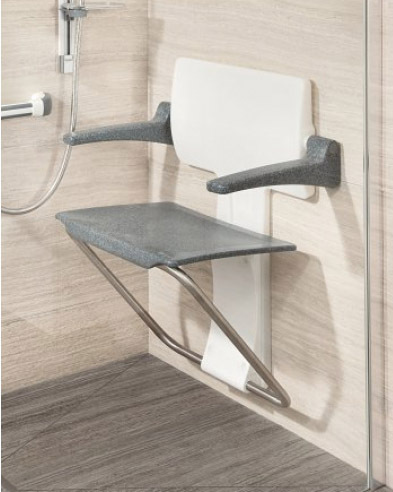 Easy to clean and hygienic - with no dirt traps for bacteria and the seat is angled at 4º so water runs off the back. Easy fold down mechanism, simply pull out the front edge so that the rear of the seat slides down the arms then fold neatly into place. Fantastic design! I have a small shower and a disabled mother who needs a seat with arm rests. The Slim Fold is perfect - she steps in, moves into position and I drop the (warmed) seat and arm rests. The compact design means there's plenty of knee-room. And when it's folded away, it's so slim that it doesn't impede able bodied showerers. Not only that, it looks great. Brilliant! The only negative is the fitting instructions, which are less than lucid. There are only 6 pieces and I still have 2 of them left (any ideas what the 2 rubber washers are for?). When you order one (yes, do - you won't be disappointed) , be careful how you open it as the template for seat height and screw holes are on the box. Fittings are NOT included. We used 8 x 4 inch no 12 brass screws. Oh, a couple of the seams were a bit rough, so I fettled them with some fine sandpaper, and now they are fine. 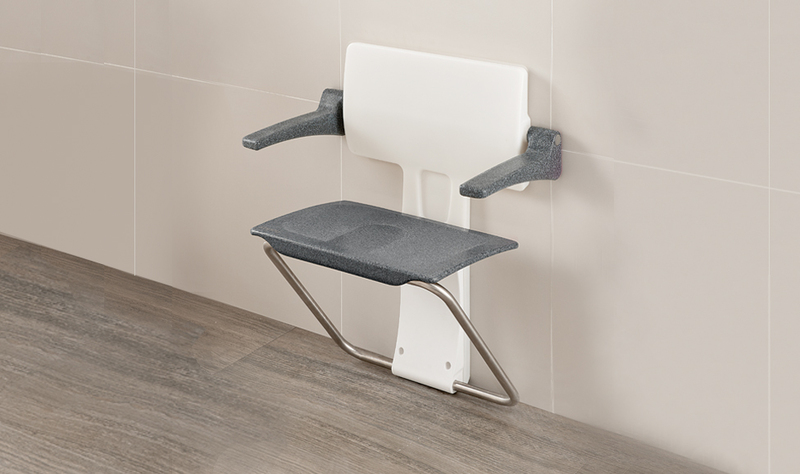 I love my Slim Fold Shower Seat.